I was here a few months ago with my wife and I am here today with my in-laws. Today instead of set we took aka-carte. The highlight for me was of course to try their Vietnamese coffee. 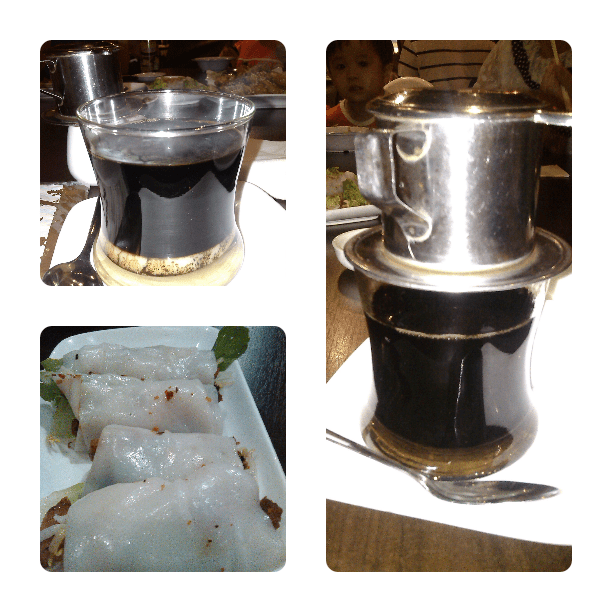 Any Vietnamese restaurant which does not serve good Vietnamese coffee, please… do not call yourself Vietnamese coffee. So, did Vietnam Kitchen lived up to its reputation? Yes, superbly. Their Vietnamese coffee was really strong and the condensed milk was just right. There’s that special Vietnamese coffee flavour if you know what I mean. If I were to rate, this would be one of the best Vietnamese coffee I have ever tasted in Malaysia. Sorry, I have no immediate plans to go Vietnam at this moment. What about the food then? Ok, I love the Fish with soya sauce. Simply loved the fried fish as I could nearly eat every part of the fish! Other than that, the rest of the dishes are good but nothing special. Portions are a little small to me. The Vietname spring roll is ok. I think for those going there take their sets and order the Vietnamese coffee. their sets are value for money. Environment wise, I would prefer a brighter place but I think they are trying to give you the cosy feel. It’s ok, I will go again. Citibank card holders get 10% off too. written on 11th Dec 2013. Next Suggested Article: Heritage Village – Paradigm Mall has Kuih Koci! Penang property choices – RM400,000 – RM500,000? thank you. what an awesome and attractive offer. your taste, i trust.